Exclusive two-hour tour with lunch or dinner. We recommend two people or more, for families, groups of friends, stage parties, hen parties and family events. Choose one of our deals! Dinner in Zsolnay dinnerware and crystal glasses, served by our Chef. DJ lounge on the deck, sofas and cocktails under the palm trees. Budapest has many faces. Calms down a little bit at nights, lights are lit up at dusk and other kind of mood enchants us. This program for those who love live music and welcome a romantic dinner setting. During the 1.5-hour cruise, excellent buffet meals are served. 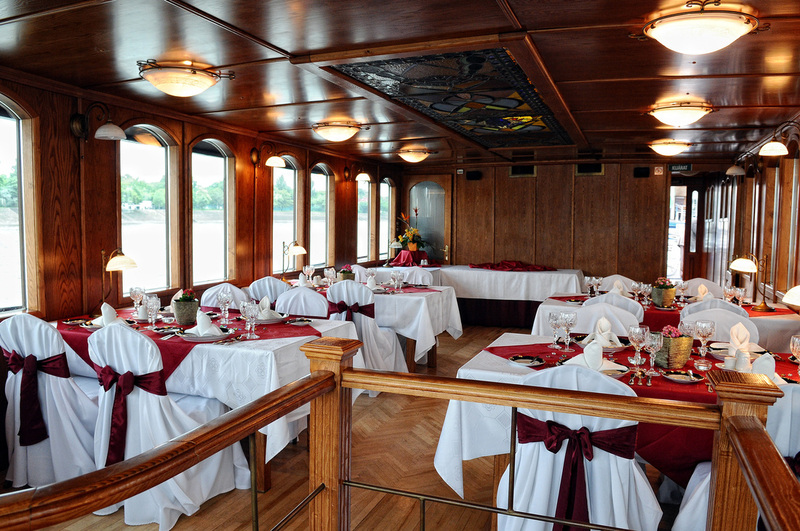 The Dinner & Cruise begins with a welcome drink on the deck of our air-conditioned or heated ships. After that, your guests may choose from a variety of cuisines from the buffet table. The program is available without dinner as well. The ticket price contains a welcome drink and a second drink: soft drinks, wine or beer. Dinner & Cruise with live music every night from 19:00 (except August 20 and December 24).